Storrer Perry Mason / Erle Stanley Gardner Web Site. This is an unbiased Perry Mason Web Site by the one person who has read/seen ALL the ESG novels and ALL the original 1950-60s TV episodes. There is no commercial value gained by William Allin Storrer, creator of this site. This main Perry Mason page was updated 14 Septembert 2013 and is copyright ©MMXIII by William Allin Storrer. Fortunately, the new CBS-Paramount half-season sets are complete for all but 1:12 of episode 49, The Case of the Fancy Figures, which is complete on CBS Videotape 24377. and some smaller omissions detailed in specific synopses. Using the new complete-season sets, I have upgraded my synopses for all nine seasons. The 9 seasons are now completed on August 13, 47 years after the last broadcast. This site was first put on the web in December 1999. It is complete in terms of plots. Plot synopses are now provided for all 271 TV episodes and all 82 novels. You can click on a title in the index of each season series (see below) and reach the particular show directly. Or you can do this directly from this main Perry Mason / Erle Stanley Gardner index page for both the television series and the novels. Where a novel was used for a series show (or two), these are fully cross-indexed with direct access from novel to TV or vice versa. All episodes in all seasons have been upgraded with full spell and grammer checks. The Storrer Perry Mason site is different from others in two ways; 1. It provides full plot synopses of each one-hour television episode of the original series. Those wanting the 2-hour shows will have a long wait unless someone else wants to do it, and, 2. This site provides full plot synopses of each of the 82 Perry Mason novels and 3 novelettes by Erle Stanley Gardner, allowing for comparison with what the script writers did to make the books suitable for broadcast television. We may one day add the1930s Perry Mason films (The Case of the 1. Howling Dog , 2. Curious Bride , 3. Lucky Legs , 4. Velvet Claws , 5. Black Cat , and 6. Stuttering Bishop ) though, of course, Raymond Burr is not Perry Mason, but they have the imprimature of Erle Stanley Gardner. The later 2-hour TV movies may have Burr, but no supervision by Erle Stanley Gardner, so they cannot be considered authentic. All nine seasons are now available from CBS-Paramount. 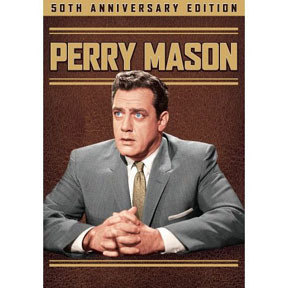 This is tthe only complete Perry Mason on DVD. All other version are incomplete. This 50th Anniversary Edition was released in April 2008. It includes bonus materials such as Screen Tests of Raymond Burr for both the parts of Hamilton Burger and Perry Mason, and William Hopper as Perry Mason. Della Street, looking as beautiful as ever, provides comments to each of the shows. Of the 12 episodes included, only three have not appeared on CBS/Paramount Classic Edition tapes, the Cases of the Envious Editor, Constant Doyle and Bountiful Beauty. CBS HAS SCREWED UP AGAIN, omitting 1:12 from Chapter 3, the scene with Carolyn Ellis in Perry Mason's office in The Case of the Fancy Figures, episode 49. If you buy the set, or even if you don't, phone 323-956-8070 (Paramount Consumer DVD Hotline) and ask when a corrected version of Season 2 Volume 1 will be available. If you have recently purchased the set and CBS-Paramount have corrected this, please let us know. WARNING TO ALL PURCHASERS OF "PERRY MASON; THE COLLECTOR'S EDITION." Volume 20, DVD 35228, has a MASSIVE content error. "Perry Mason in The Case of the Haunted Husband" is missing 6:35 of the original broadcast. The Columbia House tape 20457 is 52:42 in duration, the DVD 35228 is 46:07 long. Missing are three full scenes and snippets of at least two others. The synopsis of this shows what is missing. This is Episode 19 in the first season and you may access it by clicking here: <Haunted Husband> If you have recently purchased this set, check the timing. If it is 52:42 or near that, let us know!! Volume 22, DVD 35230, has a MASSIVE content error. "Perry Mason in The Case of the Lavender Lipstick" is missing 5:30 of the original broadcast. The Columbia House tape 20457 is 51:44 in duration, the DVD 35230 is 46:14 long. This is Episode 100 in the fourth season and you may access it by clicking here: <Lavender Lipstick> HAS ANYONE PURCHASED THIS VOLUME RECENTLY? I'D LIKE TO KNOW IF CBS PARAMOUNT HAS CORRECTED THIS OMISSION. Raymond Burr acted in many movies. WolfHound's Golden Movie Retriever, the standard reference to movies, has at least one omission. They do not list "Blue Gardenia," Burr's sixteenth movie, released in 1953. Burr is a womanizer who gets murdered, and the plot is remeniscent of at least two or three Perry Mason mysteries. Directed by the famous Fritz Lang, it featured Anne Baxter as the accused murderer, defended by Richard Conte. Ann Sothern and Nat King Cole also appear. To GO TO A SEASON (or part), click on it below. To find a specific show/Episode and its order, use the alphabetical tables at the bottom of this site. For single episodes A through I, click HERE. To view J through W, click HERE. CAST LISTS! ACTORS! ROLES PLAYED! All on one very long web page. Find your favorite actor and all the episodes in which s/he played a part. Or find a character and who played her/him. CLICK HERE. This is a VERY large file (550k), so requires a fast computer with a lot of memory to load in a reasonable time. If you need everything in one place, this is where you should go. However, if all you need is the main characters or those who appear often, such as judges and autopsey surgeons, CLICK HERE. This is a small site (71k) which will load quickly. If you are looking but for some actor who appeared only once or perhaps twice, except for judges, court clerks, autopsey surgeons and the like, CLICK HERE for that listing which, though still long (488k), will load much more quickly than the full file. Most often, Gertie got cut. She added much needed color, even occasional humor, to the program, but little to the plot line. In one show, The Case of the Fiery Fingers for instance, a scene opening after a commercial break has her telling a phone caller that Mr Mason will be back shortly. She hangs up, reaches for a chocolate in an open box on her desk just as Paul Drake walks in. He says, cheerily, that the chocolate has 200 calories. Gertie puts it back in the box. (Gertie never saw a chocolate she didn't like, yet she was at most pleasingly plump, even on the thin side of plump.) Just then Mason arrives. This is where you will see the action resume after the commercial break in current broadcasts. Our latest upgrades show who actually appears in a show. By the second season Della Street answers the phone from Gertie, but Gertie has been written out of an appearance. Gertie appears only once in the second season, once in the fourth season, and thrice in the seventh season. A further problem arises when some scene with important information is cut. Consider The Case of the Fan-Dancer's Horse, (Columbia House eliminates the "Fan-" in every reference over which they have control; it is correct in the video episode title) where the landlady scene, in which Mason receives an important bit of information, is entirely cut, in 48-51-minute broadcasts. Also, scenes may be rearranged to bring in the needed information where it is revealed at a later point. Often humorous bits which enliven the episode are cut. Almost always an entire scene early in the episode is cut to get as many minutes cut in a single slice as possible. Then the information we lose in that scene, which often is with one without Mason, is presented in dialogue in a later scene which includes Mason. There is thus no way one can know this from viewing a broadcast, unless one follows the script synopsis provided on this web site. We really need congressional consideration of any altering of original shows, by time editing, cropping (from wide screen movies, for instance, to "pan and scan" versions), to be a violation of the copyright of the original creating artists. The CBS tapes from Columbia House Video correct all of this for us serious Perry Masonites, giving us a complete air check with the original sponsors in the credits. Their tapes, as once available, presented only 122 of 271 episodes (45%). We have reviewed all these tapes to upgrade our synopses for this web site. We have also compared an early 80s set of tapes (1983-1984 broadcasts), which seem complete, to a set of late 80s tapes which were time doctored (=shortened) for those episodes which are not (yet?) available from CBS. A minor point; Columbia House often gets air dates wrong, sometimes by a day, other times by weeks. The Case of the Crimson Kiss is given an October 19, 1957 air date by Columbia House, but that is the correct air date of The Case of the Sulky Girl. The Kiss was aired on November 9, 1957. To view the complete list of available Columbia House videos of the Perry Mason episodes in the order they have been released, CLICK HERE. To view a listing of the Columbia House videos of the Perry Mason episodes in the order they were broadcast, CLICK HERE. Of course, the CBS-Paramount box sets of half seasons are now the standard by which all must be checked. There are other good web sites devoted to the original Perry Mason black & white (with one exception) television series of 271 episodes. Cast lists, short plot synopses and other information is contained on these sites. I have relied on some of these to check my own information for accuracy. The first alternate site that you might wish to explore should be Dave M. Brockman's Big Dave's Perry Mason TV Site at <http://www.perrymasontvseries.com>. Dave's "Perry Links" will take you to other useful sites. You might also wish to pursue <http://www.drberlin.com/perrymason2.htm> where you will find a listing of the 2 hour shows from 1985-1993 as well as a bulletin board for posting questions to other Perry Mason fans. To email me, use <michiganbill@storrer.com> Please report any problems or errors you discover, in particular, links that don't work, and missing scenes. Thank you. To GO TO A SPECIFIC NOVEL, click on its title. A NOTE ABOUT HOW THE VIDEO SYNOPSES ARE DONE. The first round of synopses, done prior to 1997 and from deficient air checks, were "on the fly." Notes were taken at the computer as the tape played. Many mistakes were made, as characters were often misidentified, and there was little detail. The second round was done with available Columbia House tapes, filled in with a variety of air checks, some full-length, others edited. A third round was done only from Columbia House tapes and known full-length air checks, so were complete in terms of representing all credited characters and all scenes. A fourth round runs parallel with the third, and was done from the DVDs. As we do and redo the synopses, we get better at delineating significant or interesting details, and we often find glitches in what transferred from computer word-processed page to web page. For instance, two whole sentences that were missing in the web rendition were discovered in the viewing of the DVD "The Case of the Restless Redhead." To aid you in finding a specific show/episode, the following is a list of the shows/episodes, by the first word of the title that follows "Perry Mason in the Case of the" (except, of course, the two shows without the second "the," namely, "The Case of Paul Drake's Dilemma" and "The Case of A Place Called Midnight"). Thus, Rolling Bones will be under "R" not "B". There are some 72 listings in which the television show has the same title as, or is clearly derived from, an Erle Stanley Gardner novel. In the first television season, only four of the shows were not related to one of the novels. Only 14 of the second season's 30 shows come from novels. Thereafter, no more than five shows in a season are derived from the novels. To view J through W, click HERE. To go back to the top of A through I, click HERE. To go back to the top of A through I, click HERE. To go back to the top of J through W, click HERE.